DH and I went globe trotting to celebrate our 30th(!) anniversary: Amsterdam, Bruges, Paris. I’m finally starting to catch up with myself after jet lag plus a busy week at home. 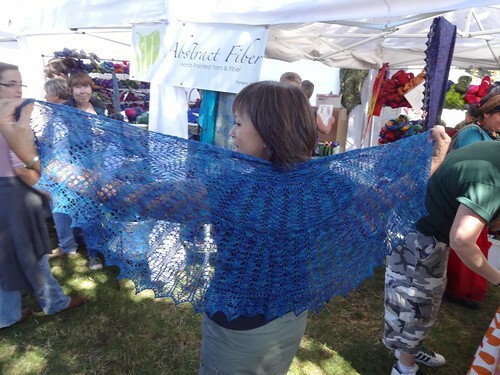 We arrived home on Friday night at 11, and I went to Oregon Flock and Fiber Festival the next day at noon. 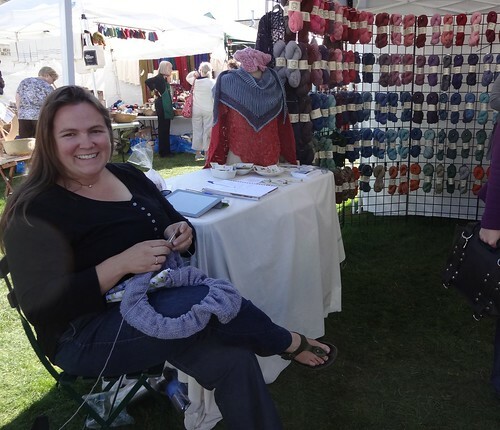 I didn’t want to miss my favorite fiber festival of the year, and I couldn’t go on Sunday. The weather was gorgeous: sunny and warm. 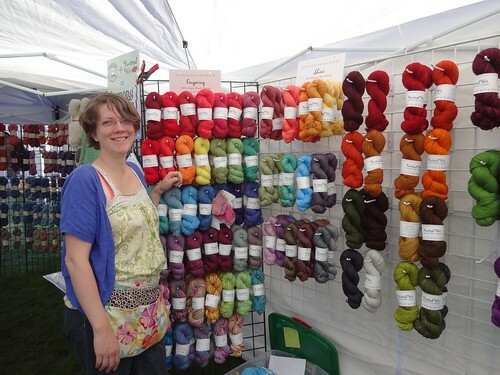 This is the first year since I started going to OFFF that I didn’t help Lorajean (Knitted Wit) set up her booth. Looks like she managed to get it done without me; set-up day was my travel day. It was Brooke’s (Sincere Sheep) first OFFF; she came with a beautiful rainbow of yarn and fiber. She and Lorajean are launching more Among Friends fun; check it out here. 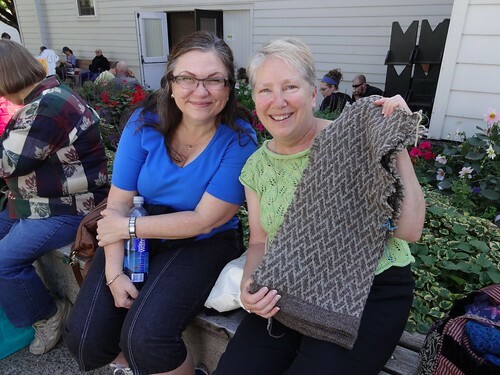 I took my half pi shawl to Abstract Fiber to show Susan what I had made with her lovely laceweight Hepburn yarn. This was the shawl I made for my birthday, but really it was for our anniversary dinner in Paris. Dinner and the shawl were both lovely. Yvonne (Lavender Sheep) and her new little one were there. 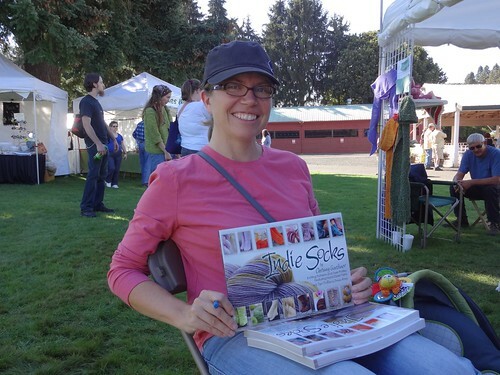 Yvonne is a dyer, and also the organizer of the Columbia Gorge Fiber Festival, coming in April. Chrissy Gardiner was at the Lavender Sheep booth signing copies of her new book, Indie Socks. This book is full of Chrissy’s beautiful and clever patterns for socks using yarn from indie dyers. 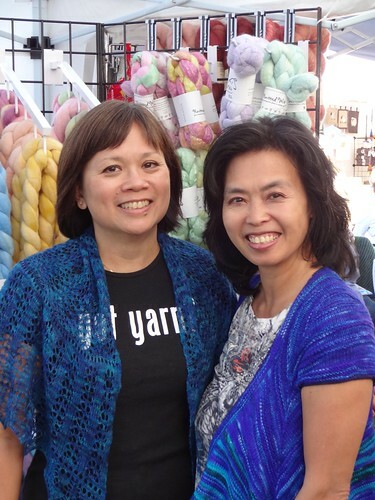 Nadine showed me her handspun sweater project. I last saw it in our steek class last spring. 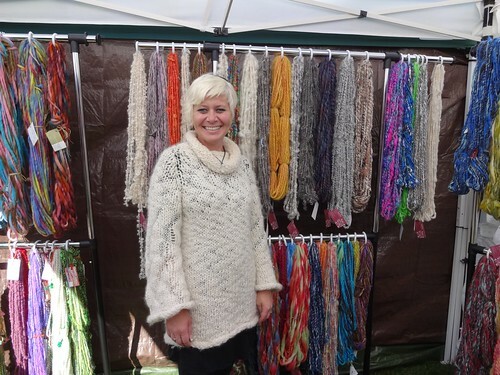 Yes, she cut her handspun knitting! I had a nice chat with her friend Midge, too. I didn’t make it to the animal barns. I came home with just a little yarn. I wanted some browns, which I’ve never worn before. I’m branching out! 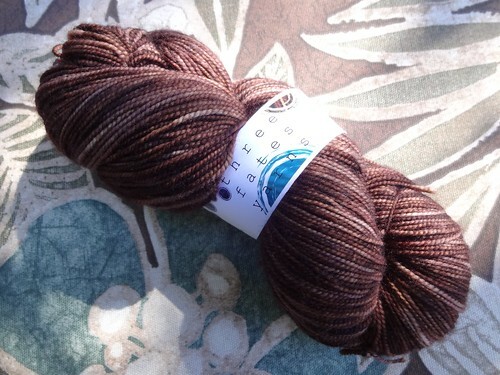 Lovely warm browns in this Eponymous Sock yarn, color Mulch, from Three Fates Yarn. 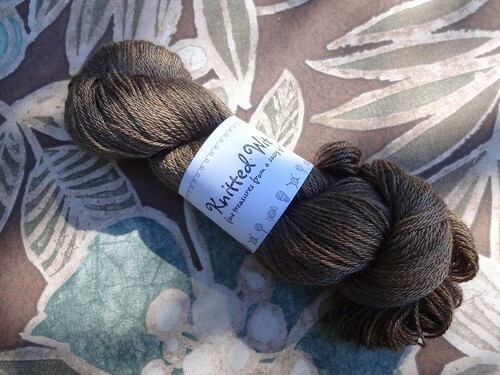 And this cool brown Shine from Knitted Wit. 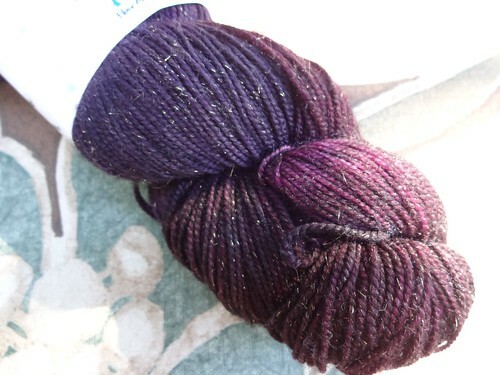 This plummy Icicle Creek yarn from Rain City Fiber Arts. I fell for the color, and the golden sparkle of the stellina. Did you go to OFFF? What have you been up to while I was gone? I’ll tell you about my travels in another post. This one is long enough already! 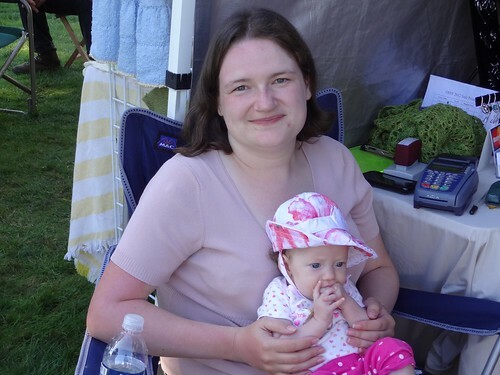 This entry was posted in Knit, yarn and tagged OFFF. Bookmark the permalink. That looks like a wonderful festival. LoraJean sure has some pretty colors! Excellent photography! Thanks for sharing your journey. You’re welcome! My new yarn is much prettier in person, but I was in a hurry to get a blog post out, since I was gone for 2 weeks. 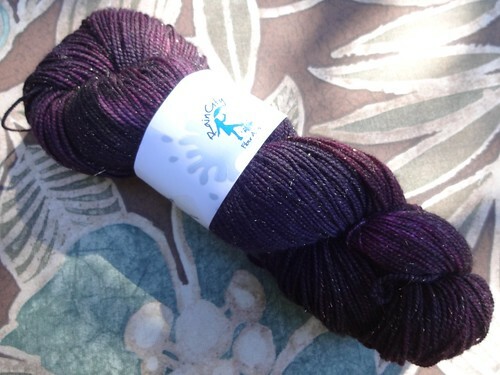 I’m sure the yarn will turn up in another post…when I figure out what I want to do with it! Next year I would love to tag along. So nice to see you there! I was hoping you’d be there. I love the brown yarn I bought from you. Now to decide what it wants to be. I know it’s sock yarn, but I don’t want it to be socks!